Ca' Luna, refuge of dreams, memories and ambitions, site of exalting love. Faithful and silent custodian of old traditions handed down from generation to generation. On the sunlit terrace the seasons of life's rituals flow sweetly. Magnificently adorned with fragrant flowers, geraniums, old palm trees, massive aloe plants, Ca' Luna lets one see the passage of time though its old walls, covered in lichen and silver-toned ivy. The nights at Ca' Luna, enchanting, silent, adorned by the sound of distant bells and the wind, the moonlight penetrating each room in a slivery shadow, divine. The notes include galbanum, fennel, mastic tree, ivy, white pepper, elemi, rum, sandalwood, leather and musk. You know, I couldn't find anything about the designated gender! 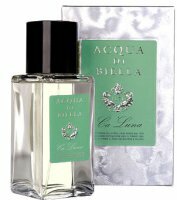 I have 3 of the 4 Acqua di Biella scents, and they are all lovely. Only one is too masculine for me to wear. i'm going to email Franco at Luckyscent to see when they will be getting this in – they carry the rest of the line. I really liked Janca, but can't remember the others at all, sadly — memory long since shot, so if I didn't write it down, it's all gone.